Virtual reality sounds terrible. The bevy of 360-degree video cameras are visually immersive, but what they lack is the ability to reproduce convincing 'lifelike' audio. And, at first glance, you might not expect the Sennheiser Ambeo Smart Headset to be any different but, give them a listen, and you'll realize that couldn't be farther from the truth. In fact, these aren’t the kind of earphones you can position into a set category because, in some ways, they’re meant to produce rather than just play. It’s that element that makes them “smart” – you get active noise-cancellation, binaural 3D audio recording and audio transparency to enhance the ambient noise around you. Not to mention an app with a decent equalizer and other custom options. The concept behind the Sennheiser Ambeo Smart Headset is simple; it can record moving sound. If you take a video of a car driving from left to right across the shot while wearing it, the audio will move with it. Using an omni-directional microphone in each ear, it records the audio where you hear it. And it gets better; the recorded audio can then we played back through any regular pair of headphones. But they also sound really good, so the main checks are marked. The biggest problem they face, honestly, is that it's unclear who would benefit most from this mix of audio wizardry. But, if there's one group we can rule out, it's Android owners. For now, these earphones only exist for the iPhone; the audio cable is terminated in Apple Lightning (which also provides the power), though Sennheiser told us that it will also develop a version for Android devices. The Apple Lightning termination is critical because it takes advantage of new audio processing features in OS 10.3.1. They have grilles housing microphones underneath that are designed to record spatially to capture sound in what Sennheiser is calling “3D.” It’s more marketing than misnomer because it’s just a fancier way of saying surround sound. The point of having it is to record far more audio information than an iPhone or iPad could hope to achieve. Doing that would then result in a video or audio recording that captures far more of the scene’s audible surroundings. The beauty of it for Sennheiser is that users don’t need to wear the Ambeo to hear the effect afterward. Binaural recordings are complex because they mimic the way in which human ears process sound, which is to say that sound doesn’t enter one’s ears at the exact same moment. That’s exactly what this headset sets out to emulate. Thankfully, 3D audio capture is pure plug and play. Controls are on an in-line remote on the cable, though there’s not much to explore; the binaural mode is always-on, the volume buttons are standard issue, and there’s the usual mic for hands-free calls. There is a ‘transparent audio’ control for reducing or increasing background noise, but that's about it. Inside the in-line remote is an analogue-to-digital converter and Apogee’s SoftLimit tech, which syncs the timing, volume and timbre of the sounds captured from different directions to create the 360-degree soundfield. Within the Ambeo app (available free on the App Store), there is a QuickStart Guide to explain how the different features work, including video, along with a graphic EQ and selections to adjust the situational awareness options. There was something weird about wearing a pair of earphones, and yet feeling like we could hear everything around us with noticeable clarity. Indeed, we were struck, when using them in Amplify mode – an ANC function which boosts everything around you, filtering your surroundings through without forcing you to take off the earphones – that we could overhear conversations of people sitting nearby. Let’s be clear, though – the Ambeo isn’t some Bond-style spy contraption. We weren’t pulling in conversations from across a room, but there was a noticeable boost that enhanced voices. It happened when walking by people talking on the street, as well as on a bus or subway train. We reckon the distance was as close as two feet in most cases, but we even caught the gist of a conversation from double that distance. That was crazy, and even a little creepy. We had no intention of eavesdropping, yet it wasn’t lost on us that we were essentially wearing a hearing aid. There’s no way to record anything using Amplify, though we did try to see if there were workarounds. Recording anything always defaults to whatever (Natural or Reduced) is set. We were also plenty impressed when turning the tables the other way: Noise-cancellation was excellent, drowning out the noise common with public transit. We could barely hear a peep of the roaring and screeching of the subway train and, if anyone was talking around us, we couldn’t hear it. It continued at street level, too. We played around by noting how good noise-cancellation was, but also the audio recording. Any city street will have its share of random noises coming from different directions, so we tried shooting video to gauge it. In one instance, a truck’s diesel engine passed by at a fairly slow speed. People walked by chattering. A couple of honking sounds. It was a pretty standard combination of street sights and sounds. When played back on the Ambeo, however, the audio felt far more spatial than a similar video we shot using the iPhone X’s microphones. Even playing it on other third-party headphones produced a similar effect. The best part was that it was easy to hear when a sound was coming closer and from which direction. Sounds captured by the left microphone were distinct on that side, just as it was with the right mic. 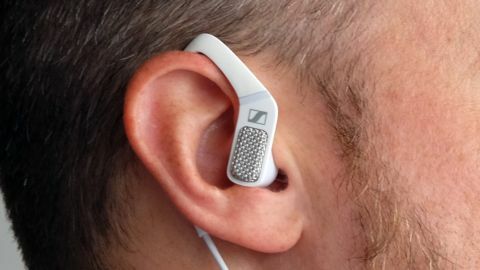 Sennheiser suggested users move their heads in the same direction as the phone when shooting because of how the two earphones record sound. Since the phone isn’t capturing audio itself, the spatial audio could feel off if the phone is facing a different direction than your eyes. Even so, as cool as all of this was, the recordings aren’t totally bulletproof. There’s a slight hiss that we confirmed when shooting in total silence. It’s less obvious in a noisier recorded audio or video, but it’s still there. Amidst all the audio trappings is the Ambeo’s standard ability to playback music. Not surprisingly, these earphones delivered. Bass was nice and hearty, with solid highs, bridged together by superb mids. We weren’t really left wanting when listening to anything on these. Naturally, there’s always room for improvement. We could see some users wanting more bass (or cowbell?) or feeling more pop in the vocals, but we’re of the mind that most wouldn’t complain too much about this mix. Whether it was hip hop, rock, house, pop, jazz or great movie scores, the Ambeo pumped it all out with verve. We should also note that phone calls were excellent as well. Callers sounded really clear, with equal clarity noted on the other side. We had callers unsure as to whether we were using earphones at all. The binaural sound effects are impressive, and they do really add something that the virtual reality era is missing or, at least, will miss once VR hits the mainstream; 360 degree sound is the future. Despite the main feature being theoretically complicated, the form factor is familiar and it's so easy to use. Videos can be exported from the iPhone to a computer or tablet for listening to that same exact, original binaural sound field via any pair of earphones or headphones, or through a home cinema’s surround sound system. However, the Sennheiser Ambeo Smart Headset's biggest win isn't in creating binaural sound, but just in capturing better, more intricate sound. That's underlined further by the fact that these are also just plain great stereo earphones. But, conversely, it’s just that the sum of all these parts isn’t for everyone. If you’re not into the 3D recording and audio transparency, it’s hard to justify spending $300 (£259, AU$469) on the Ambeo. Not to mention Android users are cut out of the equation and the awkward sports styling that might not be everyone's taste. If you're an iPhone user and like the idea of experimenting and using the audio frills squeezed into these earphones, however, you’d be hard-pressed to find anything comparable right now.